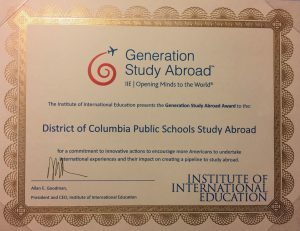 Tagged with District of Columbia Public Schools System, Generation Study Abroad, Generation Study Abroad Award, IIE, USA. 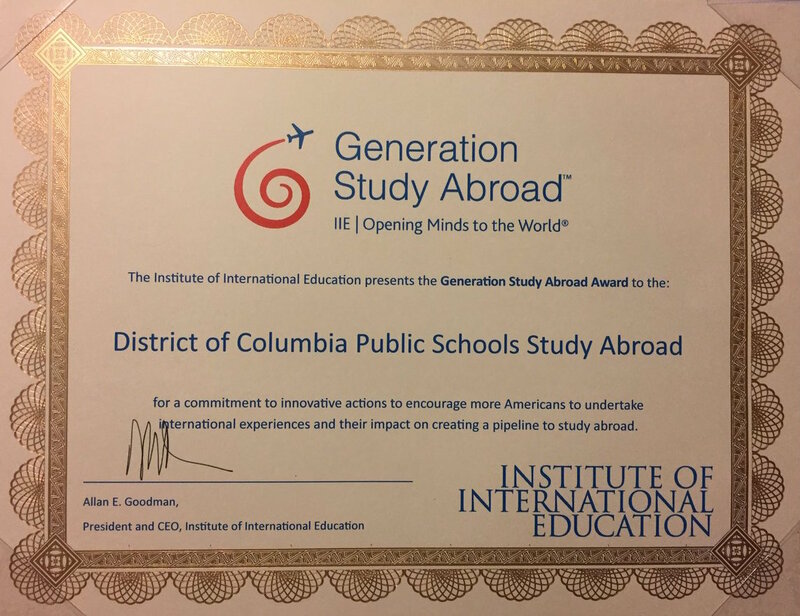 The District of Columbia Public Schools System has been commended by IIE for its groundbreaking initiative to offer fully funded study abroad for all of its 8th and 11th grade students. DCPS students on a language and service learning trip to the Dominican Republic. Photo: DCPS. "We think it’s crucial that our students see the world, that they have the opportunity to use their language skills in a new country"
The Generation Study Abroad Award was presented at IIE’s GSA Summit last month in the capital, in recognition of DCPS’s Global Ed initiative, which sent around 380 students overseas for short-term language immersion, global leadership, or service learning trips after launching this spring. The district aims to up that figure to 500 students next year, and 4,000 by 2020. “We think it’s crucial that our students see the world, that they travel, that they have the opportunity to use their world language skills in a new and different country; that they understand and engage with different cultures, customs and communities different from their own,” commented DC Public Schools chancellor Kaya Henderson. All DCPS Study Abroad trips are fully funded, including passport and visa fees, travel and accommodation. Study abroad options include Spanish language immersion courses in Madrid and Costa Rica and service learning trips to Nicaragua and the Dominican Republic, lasting just over a week for 8th grade students and just over two weeks for 11th graders. Global Ed also sponsors middle and high school teachers to lead trips and prepare students for study abroad. But Henderson highlighted that the district’s commitment to international education extends beyond study abroad alone. “When they’re not travelling abroad, we work to give our students a global education right here in the city,” she said. Initiatives to foster global learning include partnering national embassies with elementary and middle schools; dual language programmes; and an IB curriculum. The Generation Study Abroad Award is presented each year for “a commitment to encourage more Americans to undertake international experiences and their impact on creating a pipeline to study abroad”, in support of the GSA initiative that aims to double the number of US student that study overseas. I LOVE this…so proud of DCPS. So important to give young people a world view!